General Motors CEO Mary Barra apologized again for the flawed ignition switch tied to at least 13 deaths at the shareholder's annual meeting, and said the company is poised to succeed despite the recall crisis. "I have and will be guided by two clear principles: to do the right thing for those that were harmed and to make sure we accept responsibility for our mistakes and commit to doing everything within our power to prevent this problem from ever happening again," she said. Barra insisted the company is doing well despite the controversy about the ignition switch recall, which was delayed for at least 10 years. She pointed to strong profits, and to the fact that GM posted its best sales since 2008 in May. "Today, GM is a very good company. Tomorrow, we can be a truly great company," she said. "We can only achieve this goal if we hold each other to the highest possible standards." Last week, the company released an internal probe of its recall process that found "a pattern of incompetence and neglect" at the automaker. "The attitudes and practices that allowed this failure to occur will not be tolerated," Barra said. She pointed to 15 employees who were dismissed and another five who were disciplined in the wake of the report. The company has announced it will compensate accident victims, although it has yet to say how much money it will put aside to do so. Barra told reporters before the meeting that it should have an estimate of what it will cost to compensate victims by the end of this month. GM said it would start accepting victim claims in August. "I believe if we do the right thing for customers....we will be doing the right thing for shareholders," she said. Barra was praised by GM Chairman Theodore Solso, who said the board is unanimous in its support of her performance since she became CEO in January. "All of us on the board believe Mary has done a tremendous job," he said. "The board has complete confidence Mary will lead GM to make the necessary changes." 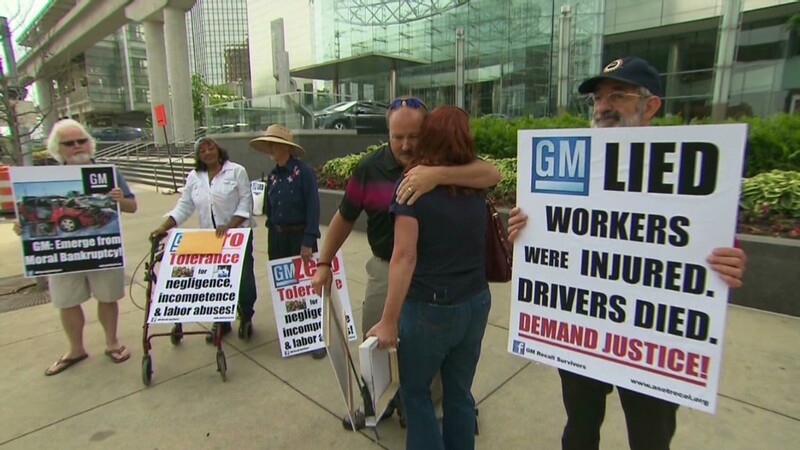 There were about 10 people who were protesting outside the meeting about GM's inaction that led to the botched recall. Included in the group were some parents whose children were killed in accidents involving the recalled vehicles. They said it was important for them to be at the meeting to show that this is about human lives. "This is their home court, where we need to be," said Ken Rimer, whose step-daughter Natasha Weigel was killed in the backseat of a Chevy Cobalt that crashed in 2006. A friend of hers, Amy Rademaker, died in the front seat in the same accident. "These two young girls died because of what they didn't do, so we want to make sure they remember what happened," said Rimer, who drove 11 hours to attend the meeting. However, none of the protestors spoke during the shareholder comment period that followed Barra's remarks.